I am an academic health sciences librarian. I have tenure. Thus I can get away with hosting a lunchtime literary open mic for three months out of the year under the guise of library outreach. 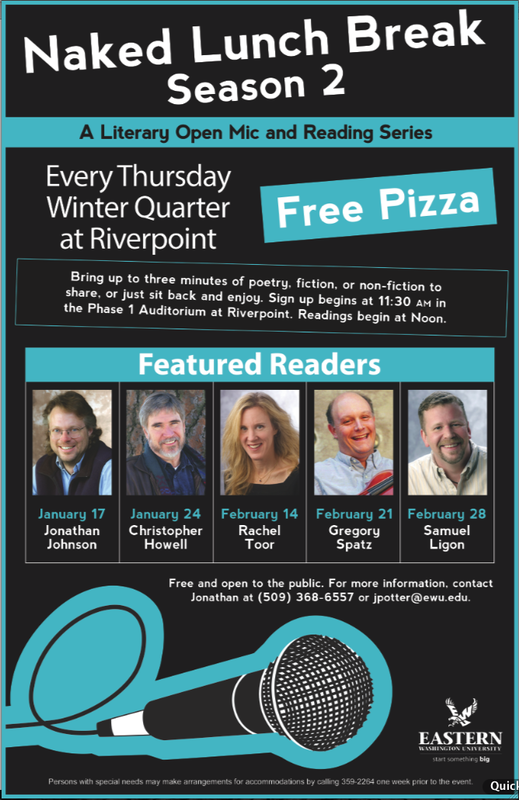 If you’re in Spokane on a Thursday, come check it out! Free pizza! I feel like this kind of thing just makes the world a better place. Nice work. I applaud you. Rachel was one of the people who convinced me to go to UM for my MFA! Small world. Maybe you can tell her I said thanks. Thanks Ellen. That’s amazing. I’ll tell Rachel. I presume my invitation to present is still in the mail. You only get away with because you haven’t buggered the bursar. Sounds like a great time, by the way. Good work. Remember to display the Korrektiv logo prominently. That might be tantamount to buggering the bursar. ‘Bursar’ is my new favorite euphemism. Can you make it a webinar? “Webinar” has long been a favorite euphemism of mine.